Ripe dragon fruits are ready to be eaten 27-33 days after it flowers. Dragon fruit is a tropical fruit known for its unique look and taste. It is not only known for its peculiar look, but it’s also known for some health benefits. It is a native fruit from southern Mexico and Central America but has already grown all over the world. Its flowers are only open at night. It is called by many names like pitaya, pitahaya, and strawberry pear. There are two common types of dragon fruit. The most common variety has red skin and green scales that looks like a dragon that’s why it’s called dragon fruit. This variety has white pulp and black seeds. The less common variety is called yellow dragon fruits. It has yellow skin and white pulp with black seeds. 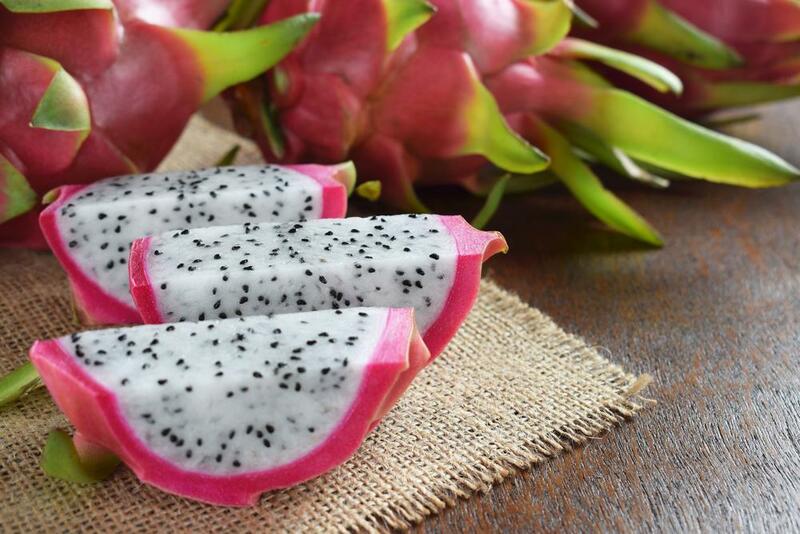 Although dragon fruits may look like one of the exotic fruits we could find, its taste is almost as similar to other fruits such as kiwi and pear. By touching and looking at it, you can easily tell if it is already ripe before eating it. If you are also interested in producing healthy dragon fruits you should have the right tools and equipment for gardening. Do you know the right way on how to pick a dragon fruit? You’ll learn more about how to pick a dragon fruit in this article. #1 Check the dragon fruit’s appearance. The inside of a healthy and ripe dragon fruit should be white or purple. Ripe and mature dragon fruit has vibrant pink or yellow color, depending on its variety. It is not yet ready to be picked when the color is still green. The outer skin’s color would be bright and even-colored when its ripeness is just right. If there are a lot of dark spots or blotches, it means it is overripe. However, a few spots are still considered normal. The leafy part extending from the fruit is called “wings”. Wings are also a good way to tell how to pick a dragon fruit. If it starts to fry out and turn brown, it is also a sign that the dragon fruit is already ripe and can be eaten. Colorful wings mean that the dragon fruit still needs more time to ripen. Under-ripe dragon fruits usually have red or yellow wings. The inside of a ripe dragon fruit also has black seeds like kiwi. #2 Touch the dragon fruit. By pressing it gently with the thumb or fingers, it will be easy for you to know how to pick a dragon fruit. The feeling should be soft. If it’s too mushy, then it means it’s already overripe. A very firm dragon fruit still needs more time to ripen, but if you plan to get a dragon fruit from the fruit store, you may buy a dragon fruit which is under-ripe and leave it at room temperature. It will eventually ripen in a few days. When buying from a fruit store, double check for damages. Dragon fruits can get damages because of rough handling, transportation, or from using sharp tools like garden tillers. Damaged dragon fruits will be smaller and dried out due to moisture loss. Check the whole dragon fruit before buying it. See if there are cracks or any signs of damages. The fruit with a dried stem is also a sign of over-ripeness. Also, check out the latest discount codes when you’re grocery shopping here. #3 Wait for the right time. Make sure that the color of dragon fruit has changed from green to yellow or pinkish red. Counting the days after the plant flowers is also another way for you to know how to pick a dragon fruit. A dragon fruit usually turns ripe with a minimum of 27 to 33 days after the plant flowers. Four days after the color of the fruit changes is the right time to wait before you harvest the dragon fruit. Before picking a dragon fruit, remove the thorns using pliers. Don’t forget to use gloves when doing this because the thorns are very sharp. When the dragon fruit is already ripe and ready to be picked, it will not be that too difficult to remove the thorns because it starts to fall on its own. Are you excited to pick your dragon fruits? Just follow the tips and don’t forget to share this article on how to pick a dragon fruit. Thanks for reading! wonderful post Racheal! everything you shared about dragon fruit is super crazy, i didn’t know that at all. cheers! You have inspired me and my daughter to start a dragon fruit diet. Beautiful website! it’s so good Derek that you cared. thank you so much for your concern, i will be in touch with you for the guidance.